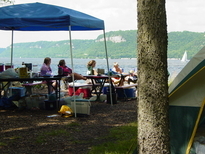 Campsites located above Lake Pepin offer tent campers a spectacular view of the Mississippi River. 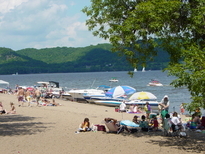 Lake Pepin was created by the widening of the Mississippi River. Make reservations early for lake view sites. Potable water is located throughout the campground. Two modern bathhouses (flush toilets and showers) are located above the swimming beach and close to the dining hall. Walking trails meander throughout the park and are open for year-round public use. Hok-Si-La has 31 regular sites and 8 group sites. Regular sites can accommodate from 2 to 4 adults (plus children) while group sites can accommodate 10-20 adults (plus children). Family, friends, youth groups and clubs find the group sites meet all their needs. To maintain a serene camping experience for all park users, cars are required to park in the parking lots, with access allowed by car only twice; once to drop gear off and once to pick gear up at the end of the stay. This policy allows for an "in the woods" camping experience for all park users. We supply Lake Pepin (widening of the Mississippi River). You provide family, friends and tents! We are a tent only campground. Firewood policy: We sell cut and split fire wood. Hok-Si-La has a mosquito control program: Call for more information. Showers are coin operated...(50 cents for 3 minutes). Train noises (including whistles) can be heard during the night. Reservations taken up to one year in advance. Camping season: Mid-April through Mid-October (weather permitting). Park and outhouses are open year-round for day use. Bathhouses open Mid April and stay open until mid October (weather permitting).